The corn snake is a North American species of rat snake that subdue their small prey with constriction. Their docile nature, reluctance to bite, moderate adult size 3.9-5.9 ft, attractive pattern, and comparatively simple care make them popular pet snakes. In the wild, they usually live around 15-20 years, but may live as long as 23 years in captivity. 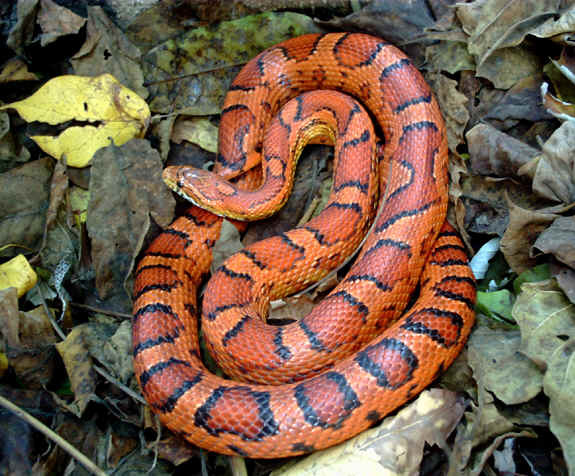 Wild corn snakes prefer habitats such as overgrown fields, forest openings, trees, palmetto flatwoods and abandoned or seldom-used buildings and farms. Typically, these snakes remain on the ground, but can ascend trees, cliffs and other elevated surfaces. They can be found in the southeastern United States ranging from New Jersey to the Florida keys and as far west as Texas. Here you may post messages or questions pertaining to all aspects and issues regarding the keeping, breeding, health, and conservation of corn snakes.